What if there was a way to book a business class ticket on your favorite airline for less? Guess what? There is! Simply Business Class offers first class and business class flights that are up to 50% off the original price! Choose from dozens of airline carriers and arrive at your destination in comfort and style. Contact Simplybusinessclass.com today to find great ways to save big on your next business class airfare purchase! Lufthansa is a German airline carrier that has numerous subsidiaries, such as AeoLogic, Edelweiss Air, Eurowings, Germanwings, JetBlue Airways, Brussels Airlines, Austrian Airlines, Lufthansa CityLine, SunExpress, Swiss International Air Lines, Tyrolean Airways, and more. Lufthansa is a major air carrier that flies both domestically and internationally. They have international flights to cities located within Asia, Europe, North and South America, and Africa. 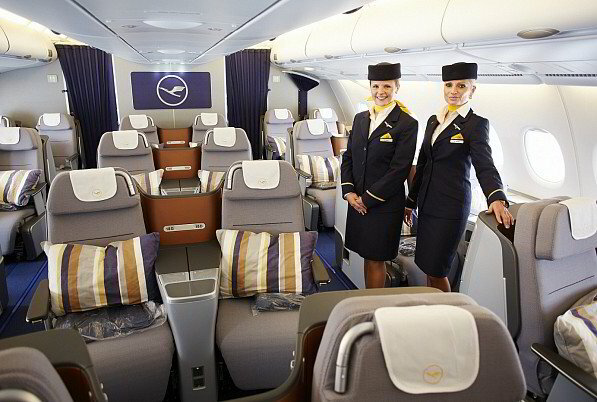 Those who fly with Lufthansa can choose from either First Class, Business Class, or Economy Class tickets. A First Class ticket provides a leather seat that is able to fully recline into a flat bed, a private charging station, a personal TV, and more. A Business Class ticket provides a seat that can recline and become a flat bed, a private power charging station, a private TV, and more. All First Class and Business Class customers are able to use the Lufthansa lounges that are located in certain airports.